Amazon’s bid to acquire Whole Foods has sparked political concerns and prompted policymakers and legal experts to ask: How big is too big? Amazon.com, America’s fifth-largest company by market value, is still growing like an adolescent and planting flags in new markets. That is prompting some policymakers and legal experts to ask: How big is too big? It’s a key issue for an economy being rapidly reshaped by e-commerce, a sector where Amazon and the merchants operating on its platform account for up to a third of all U.S. sales, according to some estimates. It’s also critical for Seattle, a city that has hitched its wagon to the e-commerce titan, and that once saw another local champion, Microsoft, mired in a lengthy antitrust battle. That fight, over Microsoft keeping a rival internet browser off PCs running Windows, almost led to the split-up of the Redmond software giant. E-commerce is not Amazon’s only game. It also dominates cloud computing, and it may soon have a significant brick-and-mortar presence, with its pending acquisition of Whole Foods Market. The unexpected $13.7 billion deal announced in June spurred an outcry among critics of the company and some members of Congress who asked the Federal Trade Commission to take a close look at the deal. Legal experts say it’s really hard to build an antitrust case against the Whole Foods deal, which would give Amazon just a small percentage of the U.S. grocery market. Amazon’s budding dominance in other markets, too, is likely to remain unchallenged in the long term, unless the philosophy underlying antitrust regulations changes. In fact, U.S. regulators have sided with Amazon against its rivals’ anti-competitive moves — such as when they charged Apple and top New York publishers with conspiring to raise prices for e-books, a market Amazon dominates. Under the current U.S. antitrust view, how consumers are treated is the prime factor, not the company’s dominance in a market. To take antitrust action against Amazon, regulators would have to prove that the company somehow harms shoppers — for example, by conspiring to make the products they buy artificially more expensive. Another way Amazon could run into trouble is by undermining rivals with strategies such as sustained predatory pricing or forcing suppliers to lock out competitors. But rather than using tactics like that, some experts say, Amazon has built its empire just by giving customers what they want — products at low prices with lots of choices — which is not against the rules, no matter how big it grows. “Antitrust law doesn’t make it illegal to get market power,” provided it was done properly, said A. Douglas Melamed, a professor of antitrust law at Stanford University and a former U.S. Department of Justice antitrust official. Amazon’s humongous size is “politically important,” but not an antitrust issue. “Not if they got there by being more innovative and more creative than the next guy,” he said. At the same time, the huge role occupied by Amazon — and other big tech firms such as Google and Facebook — is fostering a rethinking among policy wonks about how government can oversee the power of these large tech companies. “A lot of people are waking up to the fact that Amazon has positioned itself as a central piece of infrastructure for the 21st century economy,” said Lina Khan, a fellow at the New America Foundation, a Washington, D.C., think tank. She is also author of “Amazon’s Antitrust Paradox,” which has attracted widespread attention since it was published in January by the Yale Law Journal. “We need to rethink how to go about preserving competition,” she said in an interview. Nevertheless, the company last year hired a veteran D.C. antitrust adviser, Seth Bloom. Amazon’s North American retail sales, which include Canada, totaled about $80 billion in 2016. That doesn’t include sales by third-party merchants operating on Amazon’s site, which some experts estimate to be about the same, or more. Together, Amazon and its merchants account for about a third of all online sales. But e-commerce is a tiny part — about 8.15 percent — of the huge U.S. retail sector. Amazon grows fast, however. In the latest quarter, the company’s sales grew 25 percent, to $38 billion, and the company is on track to becoming the second-largest U.S. employer among the Fortune 500, after Wal-Mart. It dominates some markets, such as e-books. In others, it’s growing so quickly that it makes incumbents quake. For instance, analysts with Cowen estimate that Amazon might surpass Macy’s as the biggest seller of clothes this year. When a rumor arises that Amazon might dip its toe in a new market, stocks for potential rivals tremble, as happened to Zillow in June amid reports of a potential Amazon service for real-estate agents. Even more important than its retail power, in the eyes of some policymakers, is Amazon’s increasingly central role as a platform widely used by other retailers. Brands now feel compelled to hawk their wares on Amazon’s site, the biggest destination for online shoppers. Many merchants also pay to use Amazon’s logistics, having their products stored and shipped by the Seattle giant. Amazon, the largest purveyor of cloud computing, even rents competitors the computing capacity they need to operate their businesses. Khan, the New America fellow, likens Amazon to the 19th century railroad empires that farmers and manufacturers relied on to get their products to market — and whose power generated public concern that led to the creation of the first federal antitrust laws. “Today you have to ride Amazon’s rails,” she said. Current antitrust laws, which focus on protecting efficiency and consumer prices, are ill-suited to regulate that type of power. They also don’t fully take into account how Amazon’s bevy of mutually reinforcing businesses can undermine competition, Khan argues. But that regulatory framework could change. In the past year, the attention the issue has been getting from the media and members of Congress on both sides of the aisle “has been mind-blowing,” Khan said. In a recent Op-Ed in The New York Times, Sen. Chuck Schumer, D-N.Y., pointed to more strict oversight of corporate giants as one of the main points of the Democratic Party program. “We are going to fight to allow regulators to break up big companies if they’re hurting consumers and to make it harder for companies to merge if it reduces competition,” he wrote. 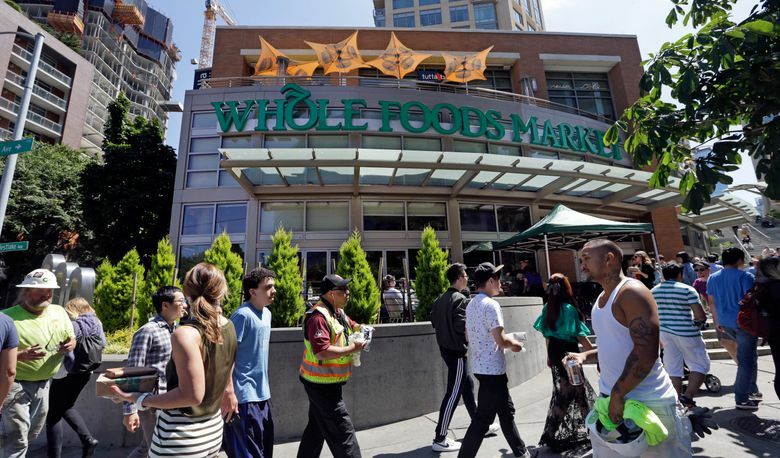 Experts say the Whole Foods deal is likely to sail through, despite the initial controversy. Melamed, the Stanford professor, said that the grocery chain and Amazon today barely compete. Whole Foods, with annual sales of about $16 billion, represents a tiny sliver of the $600 billion U.S. grocery market. And Amazon’s U.S. grocery and pantry sales totaled just $400 million in the first quarter of 2017, according to calculations by One Click Retail, an e-commerce consultancy. In the longer term, too, Melamed sees a relatively clear runway for Amazon, as long as it behaves. He acknowledged there is some restlessness among experts regarding the relative passivity of antitrust regulators in recent decades. “There’s an increasing sentiment, even among the antitrust technocrats, that perhaps antitrust law has not been aggressive enough,” he said. That laxity has allowed, in the eyes of critics, a series of gigantic deals across the U.S. economy that have increased market concentration. But Melamed expects any regulatory changes that may occur to be relatively minor — perhaps closer scrutiny of upcoming deals, or looking at a longer-term horizon when projecting whether a merger might result in competitive harm. A bigger challenge to Amazon might come from Europe. Last June, the European Commission fined Google some $2.7 billion for allegedly giving its own price-comparison service an illegal advantage by featuring it prominently in search results. It’s hard to know how this could impact Amazon. But the company has already had run-ins with European antitrust regulators. In 2015 the European Commission began investigating Amazon’s e-book distribution agreements with publishers, which required the publishers to share with Amazon information about the terms they struck with Amazon’s competitors, and to give it the same or better terms. Amazon agreed not to enforce those clauses and to drop them from future contracts, a commitment the Commission made legally binding in May. Back in the U.S., even though building a case against Amazon might be hard, it doesn’t mean rivals or critics won’t try. The disruptive effect of Amazon’s expansion on competitors could force some politically connected firms to ask regulators for help, said David Teece, director of the Tusher Center for the Management of Intellectual Capital at the Haas School of Business at UC Berkeley. “The greater the disruption, the more likelihood the antitrust agencies are going to stick their nose in it,” he said. Communication will be key for the titan. “Amazon’s not there yet. But when it gets to be dominant, it has to be careful, make sure all its conduct is pro-competitive and the public understands it,” he added.